This Waltons 5 x 7 Apex Tongue & Groove Wooden Shed ticks all the boxes if you are looking for a storage solution that offers quality and value for money. An offset style roofline provides a large amount of headroom inside, essential if you need to store tall objects such as strimmers and tools. Thanks to the robust 12mm interlocking tongue and groove cladding used to construct the walls, you can be rest assured your possessions will be completely protected from the elements. We make the floor and roof using 9mm solid sheet board; this is a tough material that is perfect for everyday general storage. Thick 1” x 1” timber framing is installed on the rear of the panels, this helps to create a solid foundation that will prolong the life of the building. The large single door features ‘Z’ shaped bracing on the inside to offer additional support; a pad bolt is included with this building to keep the door securely closed. The front window allows light to flood the interior, creating a luminous interior space that is well ventilated. Made from shatterproof styrene glazing, the window is designed to be safer alternative to traditional glass glazing and is ideal if you have children or pets. High-quality roofing felt is supplied with this building to offer a layer of protection against adverse weather conditions, essential for improving the longevity of your garden shed. We fit bearers on the underside of the floor to raise the building off the wet ground; this heavily reduces the chances of wood rot setting in. Review:Shed was poorly constructed, with wrapped timber, wrong screws and timber cut wrong. Our Reply:Good morning,I am sorry to learn of the issues you had with your shed. I have emailed you directly so we can find a resolution for you. Thank you for taking the time to provide your feedback. It is great that you are happy with your new tongue and groove shed and thank you again for your wonderful review. Review:Excellent quality and easy to put up. Thank you for sharing an image of your Tongue and Groove Shed! Great to hear you found our product easy to install. I am thrilled to know that you are happy with the good quality of your tongue and groove shed and thank you again for your feedback. Review:I looked at many sites online for my 'perfect; shed. Was very please with the one I chose which is now up and painted and looks great! 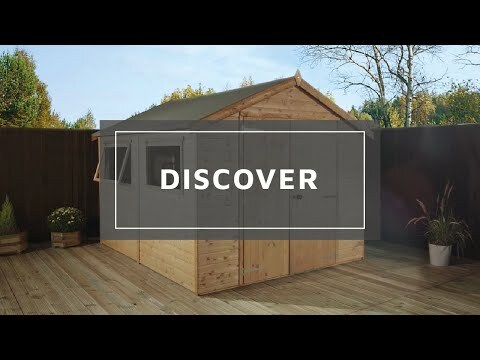 Have no hesitation recommending this product to anyone looking for this size of shed. It is fantastic to know that you are very pleased with both the quality and appearance of your tongue and groove shed and I thank you again for your great feedback! Review:Great quality and very easy to put together. I am thrilled to know that you are so pleased with the quality of your tongue and groove shed and that assembly went well. Thank you for leaving your positive feedback - we really appreciate it! Review:Impressed with the end to end service, product of great quality and easy to put together . Strongly recommended after a lot of research am glad that purchased from this company. I am so pleased to know that you are happy with all aspects of the service we have provided and that you strongly recommend. Your kind feedback is much appreciated! Review:Excellent quality and assembled with no problems. I am so pleased to know that you are happy with the quality of your tongue and groove shed and that assembly went well. Thank you again for your positive review, we really appreciate it. Thank you for your feedback and for taking my call earlier please accept my apologies once again for the issues you have experienced with your order. I am glad we were able to offer a resolution and thank you once again for your feedback. Review:Seems good so far - some heavy rain in the last week and no leaks! Thank you very much for your great feedback, if you do need anything else at all in the future please don't hesitate to contact us. Our Reply:I am glad that you are happy with your shed and it looks great. Thank you for your feedback! Review:Some parts looked as if made in a hurry - eg some nails inaccurately positioned. A nice shed, rather flimsy floor though. There were no problems I couldn't fix but not quite up to excellent. Our Reply:It is good to know that overall you are pleased with your shed. Apologies for any issues but glad you were able to resolve these easily. We also have a floor support kit that may still be suitable for you, for those of our customers that require an increased level of support.